To add upcoming events to your page simply click on upcoming events shortcode button, that can be found integrated in default editor panel in visual mode. See image below. 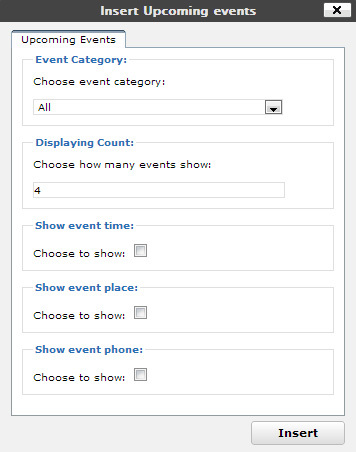 “Event category” option allows you to choose one of your event categories to show. “Displaying Count” option allows you to specify a number shown upcoming events. “Show event time” – you can check this option to show upcoming event time. “Show event place” – you can check this option to show upcoming event place. “Show event phone” – you can check this option to show upcoming event phone. To add events calendar to your page simply click on events calendar shortcode button, that can be found integrated in default editor panel in visual mode. See image below. 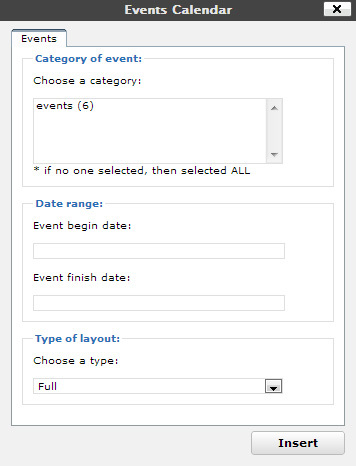 “Category of event” option allows you to select one or more of your event categories to show in events calendar. If you want to select all categories, do not choose none of the categories from the list. “Date range” option allows you to specify an event begin and finish date. “Type of layout” option allows you to choose one of two available layout: “Full” and “Active”. Full layout will show full calendar. Active layout will show only those days which was set in events.